Honour is an intrinsic quality of character that is practised by those who freely and willingly accept, and reliably satisfy, their real obligations. Integrity is the act of being honourable, despite being pressured in some way, as well as in the absence of pressure. 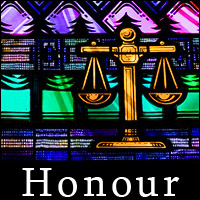 Fairness, whose most important element is true impartiality, requires honour and integrity to succeed consistently, yet the various "codes of honour" that originate from a wide spectrum of cultures and nationalities can sometimes make it challenging to recognize integrity without a pervasive view of the relevant diversifications. In the context of conflict resolution, fairness ideally leads to a resolution that benefits all parties according to their needs. Absolute impartiality is essential to fairness of judgement, and one of the main burdens of being a truly fair judge is to never deviate from the genuine practice of honour and integrity in their most basic forms. Compromise is sometimes confused with fairness, but it is less-than-fair because it is based on providing, or giving, concessions. However, compromise also serves as a practical and often reasonable secondary approach when a win-win solution is not attainable. The need for compromise can sometimes result from the lack of objectivity by a conflict's participants, thus developing the ability to truly see our own situations without biases is one of the more fascinating aspects of personal development that also has the potential to enrich our lives with the type of clarity that can also aid in eliminating the need for compromise.